This evening I enjoyed the pleasure of artist Maria Scavullo's company after she delivered a painting of hers that I recently acquired for my new apartment. We had dinner and drank wine (with a soundtrack of Nouvelle Vague, of course) and indulged in flourless chocolate cake and red bloom tea for dessert while chatting about artistic versus commercial ideals and collaborative projects as well as the joys of working solo. I absolutely adore my new painting (seen above), and it was love at first sight when I first encountered it on a visit to her studio. 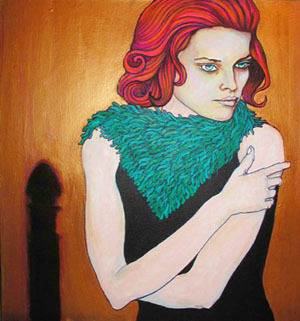 Maria's portraits of coolly stylized women have a sort of Hitchcock-esque flair that I find darkly compelling. In addition to painting, she is a professional illustrator who is always interested in new commissions (she did the illo for LaurenCerand.com). If you're interested in learning more about her work, you can contact her by email (and consider her highly recommended). I like your new painting best! Her arms are too long. Women are small.